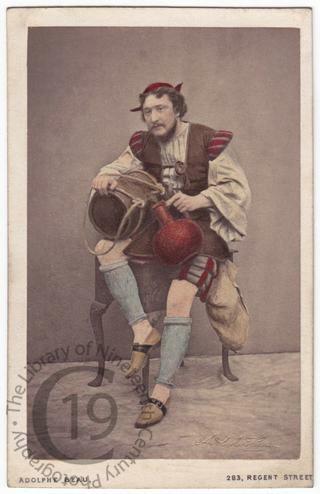 A carte-de-visite portrait of the Anglo-French actor Charles Fechter (1824-1879). He is seen here as Angelo in a production of the four-act melodrama Bel Demonio, a tale of thwarted love set in 17th-century Italy. The play was first performed at the Lyceum in London on Saturday 31 October 1863. The plot began life in 1850 as a novel by the French author Paul Féval. It was dramatised first for the French stage and then, in 1863, for English audiences by John Brougham, who played the Cardinal in the first production. The action centred around the lovers Angelo, a man of the people, and Lena, a girl of noble birth played by Kate Terry. The final act culminated in Angelo's rescue of Lena from a convent, where she had been imprisoned by her family when she resisted an arranged marriage. Photographed by Adolphe Beau of London.